The guidance provides a draft plan of the Bothnia Sea. It was developed and discussed jointly by a group of Finnish and Swedish participants. The map is followed by draft recommendations for certain designated issues. It is not meant to be a definitive plan, nor even an authorative proposal. It aims to stimulate discussion around what a transboundary plan of the Bothnian Sea could look like and which elements it could include. The draft plan also includes proposals for four specially selected areas. 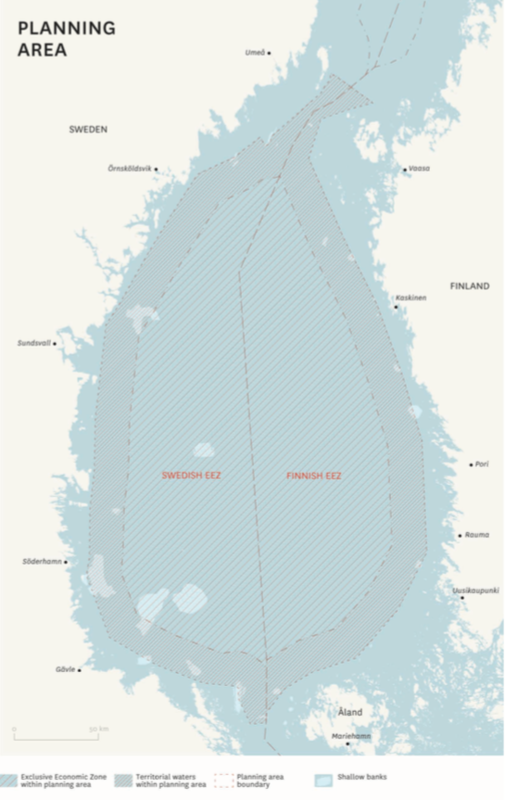 The practice explores the offshore areas of the Bothnian Sea through a legally non-binding pilot study on transboundary maritime spatial planning (MSP). The planning exercise described is an EU-funded pilot and does not aim for a politically adopted plan. It was carried out to provide a test case of transboundary MSP that would inform European processes, as well as test a set of regional principles developed through Baltic Sea intergovernmental co-operation on MSP (under HELCOM&VASAB). The focus area of the Plan Bothnia covers the Bothnian Sea waters offshore from 1nm from the baseline including the Swedish and Finnish terriorial seas and the Exclusive Economic Zone. Also its surroundings, the Bothnian Sea’s coasts, shorelines, its industry and commerce, the people who live by it and who work on its waters, the wildlife and natural features of its depths are described, supported by maps providing a summary of the identified features and interests. This material has been synthesized for planning purposes and is a basis for the pilot marine plan, taking into account roughly fifteen years to the future. This "vision" aims to be implemented by six objectives covering ecosystem integrity, protected areas, maritime traffic, renewable energy, fisheries as well as regional development. The overall objective is to obtain the healthy status of the Bothnian Sea ecosystem and to preserve its ecosystem services. The plan therefore offers some background to environmental assesssments. At the same time, possibilities for increased shipping have been secured, including the development of ports. Additionally, without compromising the ecosystem and taking into account the affect on the visual landscape, the potential for sea-based energy production has been utilized and the ecological sustainability of commercial fishing has been promoted. Importance is given to uses and activities that benefit coastal communities- such as local small scale fishing and aquaculture, tourism and recreation. Plan Bothnia has taken steps in the direction of a more creative approach to MSP, allowing more open-ended imaginary possibilities for the sea to emerge, which are not simply based on the efficient allocation of resources. During the period from December 2010 to March 2012, the project held five working meetings, in which around 20 groups from Finland and Sweden participated. These included a number of regional authorities from Sweden (County Administrative Boards) and Finland (Regional Councils but also Centres for Economic Development, Transport and the Environment). In addition, national agencies and ministries responsible for matters such as shipping, energy, defence and fisheries, also actively attended the meetings. All those involved were chosen with support from Finnish and Swedish national ministries responsible for planning. Unusually for central Europe, in Finland and Sweden existing national legislation for spatial planning on land covers the entire territorial sea. However, no planning had been carried out in the EEZ in either country during the Plan Bothnia development. The combined offshore and transboundary context therefore takes planning definitely to an unknown territory. All these factors enabled a transboundary project where the two countries could participate on an equal footing, and the results would be of value to both.